There is nothing like a good heavyweight fight live from Las Vegas. 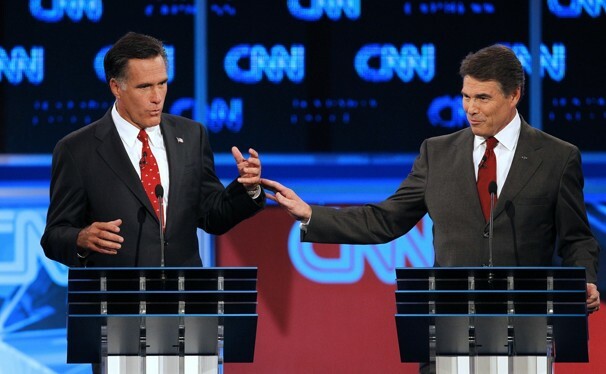 The only thing missing from last night’s rock ’em sock ’em Republican Presidential Primary Debate was the heavyweights (all of whom have decided against running). Last night’s debate was the eighth Republican Presidential debate in this campaign and was the liveliest so far with the candidates screaming at each other like the Real Housewives of New York City. After eight debates with still three months to go before the first primary, the Republicans are going to have to get creative about their debate formats to keep viewers interested. Perhaps adding Ryan Seacrest as the moderator with Simon Cowell offering immediate feedback would help. Or they could add a performance night like America’s Got Talent so we could hear Herman Cain sing Imagine There’s No Pizza. Or they could have all the candidates live together in a Big Brother house so we could see how long it takes Mitt Romney to put on his make up in the morning and we could watch everyone mix up their blue suits and red ties. Or they could send them all out in the jungle for a week without food and water and see if they eat Newt Gingrich. Or maybe one week they could each come up with a plan to cut spending in the Kardashian household. Or maybe we could just start voting now by telephone or text message and start eliminating one each week. This entry was posted in Humor, Politics, Television, TV and tagged Herman Cain, Humor, Humour, Las Vegas Nevada, Mitt Romney, Newt Gingrich, Politics, Real Housewives of New York City, Republican, Ryan Seacrest, Simon Cowell, Television, TV. Bookmark the permalink. I’m leaning toward Thomas L. Friedman.